My attention was drawn towards the Arc’teryx Quintic packs as, during the run-up to the 2012/13 winter season, the Quintic 28 (the 38’s little brother) had been hitting the headlines and scooping up the awards. With ski touring being very much on my agenda for late season, I was after a pack that would tick the boxes for days off piste and more importantly, hut to hut tours. I opted for the larger 38 pack for this reason. I’ve tested the Quintic 38 when it’s been partially loaded; days off piste etc and also when it’s been fully loaded; hut to hut tours and the like. A quick navigation stop! 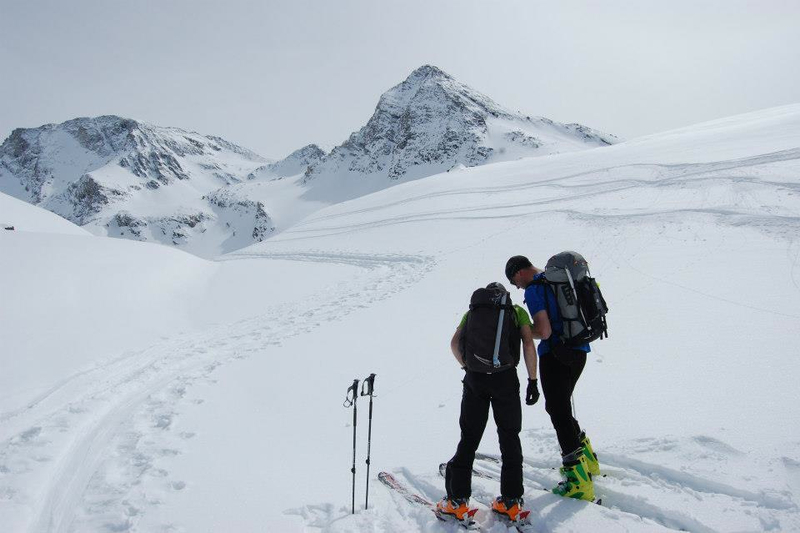 The Arc’teryx Quintic 38 in use whilst ski touring in the Vanoise National Park. First impression of the Quintic 38 when I got it was that it seemed ‘big’! And it is a roomy pack, well capable of holding everything I need for a 5 or 6 night hut to hut ski tour. I was a little concerned that it may be a bit too big and not carry particularly well when not fully loaded, but these concerns were soon forgotten when I put it on my back and started skiing! The Quintic 38 is certainly a fully featured pack and has everything the modern day backcountry skier (or snowboarder) could want. There is a dedicated shovel and probe pocket, ample room for crampons, harscheissen (ski crampons), skins, ice axe, pocket for goggles, stash pockets for your valuables, key loop, roomy main compartment and easy access side compartment. The Quintic 38 is also hydration compatible and has a simple strap system for carrying skis or a snowboard (A-frame, split and diagonal carry of skis; horizontal and vertical carry for snowboard). One of the things that really attracted me to the Quintic 38 was the way it was supposed to sit on your back and carry whilst skiing. Arc’teryx say that the back is lowered so it’s wide at the bottom and it is flat, so it fits the contours of your back. 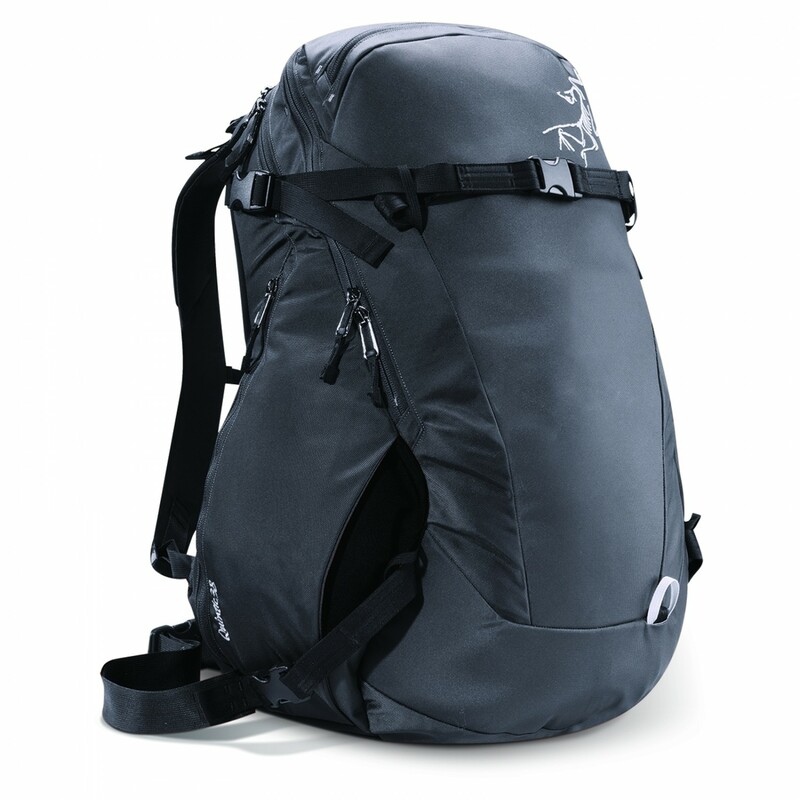 As such it transfers the pack’s load through the body’s centre of gravity and is very stable to carry. I’m definitely not the best skier in the world and skiing off piste with a big heavy bag on my back isn’t the sort of thing that really helps. In the past I’ve used standard climbing packs such as a Cierzo 35 and while they work ok, I do feel they are a bit top heavy for my liking and put me even more on the back foot when I’m skiing. 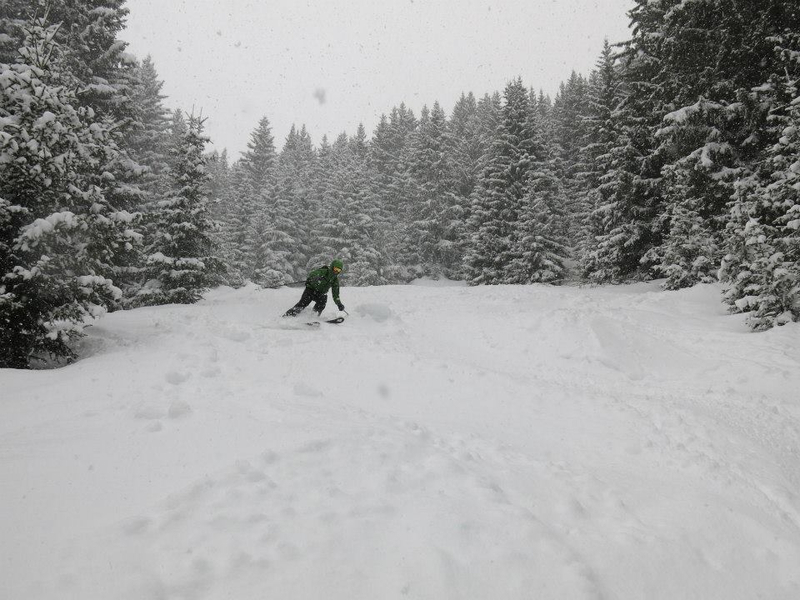 I found the Quintic 38 carried superbly and it really did feel comfortable to ski with. Even when fully loaded it didn’t feel like it was trying to pull me backwards off my skis! And although I had initial reservations about whether it would flap around on my back when I didn’t have much in it, that wasn’t the case at all. The Arc’teryx Quintic 38 carried well whilst skiing and felt nicely balanced on my back. Here it’s put through it’s paces carrying a full load and skiing great powder in the trees on a descent into Courchevel at the end of a great few days touring. Looking at the carrying system in more detail, the Quintic has a removable frame sheet contained inside an anatomically patterned sleeve that conforms to the curve of the back when fully loaded, and this as I mentioned previously, does work. The whole system feels quite substantial and I suppose the only downside I can see here is that, it’s not the lightest. There is also a waist belt and adjustable removable sternum strap which helps keep the pack stable and also spread the load. The back panel is as breathable as any other pack I’ve used and the laminated shoulder straps comfortable even when only wearing a t-shirt. The pack has numerous compartments for your kit. Arc’teryx say that there is ample room for all your kit for day tours but I’d go further than this. I think a pack of this size is easily big enough for week long hut to hut tours. I used it on a week long tour in the Vanoise national park and happily carried everything I needed for the week. Granted I was staying in huts so didn’t need to carry a sleeping bag, shelter or stove but I think with careful packing I could fit these in. At the Col d’Aussois on the way to Refuge Dent Parachee. 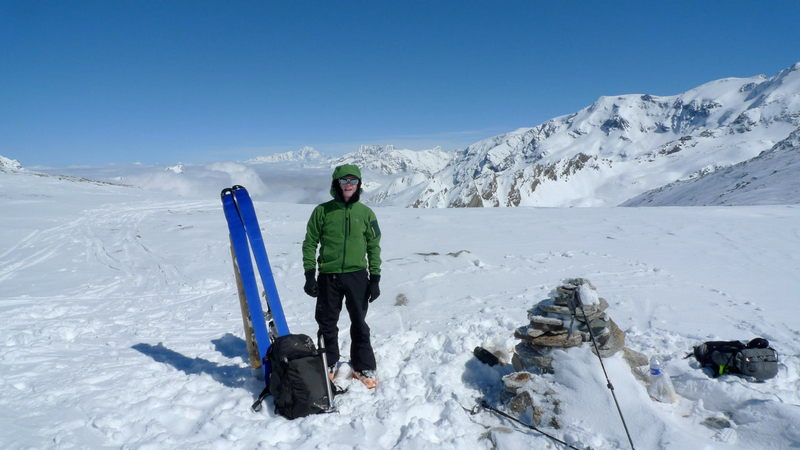 The Arc’teryx Quintic 38 is perfect for hut to hut ski tours. As well as the main compartment, which opens via a front U-zip and easily houses shovel, probe and other essentials, there is a side accessed large compartment, perfect for those overnight essentials, and also a smaller side accessed compartment, great for those on the move necessities such as energy bars, spare gloves and extra clothing. All compartments are accessed by high quality zippers with glove friendly zipper tabs. The two side accessed compartments are designed so that you can actually access them without taking the pack off and whilst this does work (I tried) I found it easier to take the pack off, particularly if I had to rummage around a bit. One final thing I’d like to say about the Quintic is that the fabric seems absolutely bombproof, almost excessively so! And whilst this leads to a super durable piece of kit, it does also lead to an increase in weight, which is my only minor criticism of the pack. But for £170 you don’t want it falling apart after a few ski tours and I think I can safely say that it won’t! It’s just the high quality you’d expect from Arc’teryx. So, all in all a fantastic pack! I love the Quintic 38, it’s got all the features and storage I need for hut to hut ski tours, but isn’t over the top for day hits as well. It carries superbly and quality is everything you’d expect from Arc’teryx and the price tag. A five star product. You can find out more about the Quintic 38 pack and where to buy one on the Arc’teryx website.